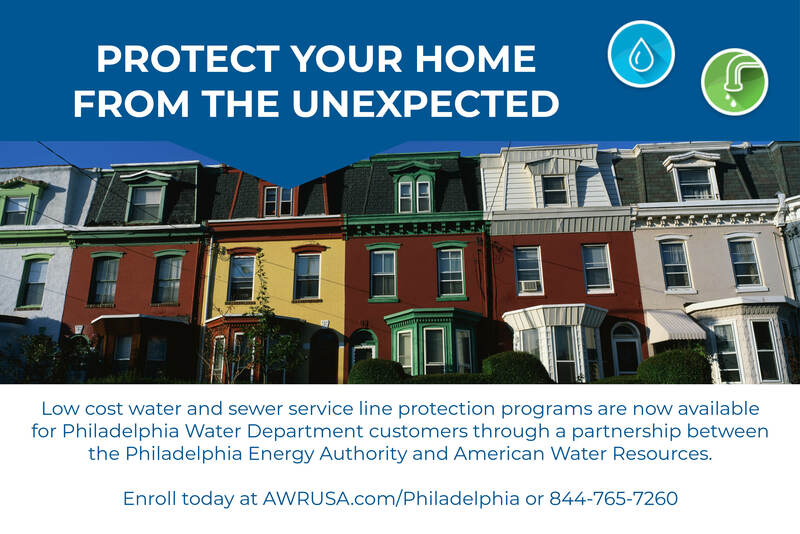 PEA is partnering with American Water Resources to offer a water and sewer line protection program for Philadelphia homeowners. Many homeowner across the City are unaware of their responsibility to maintain and repair their water and sewer lines from their home to the main line. Service line repairs and replacement cost can run households thousands of dollars. The program is being offered as a way to give homeowners peace of mind as well as a tool to preserve Philadelphia’s aging housing stock. American Water Resources (AWR), was selected through a public bidding process to provide this optional coverage to Philadelphia homeowners. AWR has been providing water and sewer line protection services for 18 years and has 1.8 million customers across the country. Through the partnership with PEA, AWR has added additional customer protections for homeowners, including minimum response times for claims and unlimited coverage for qualified repairs. Proceeds from this program help support PEA’s clean energy initiatives. Homeowners can get combination water and sewer line protection for just $7.98 per month. It offers 24/7 call support, unlimited protection, unlimited service calls, no deductibles and a 1 year warranty on all covered repairs.